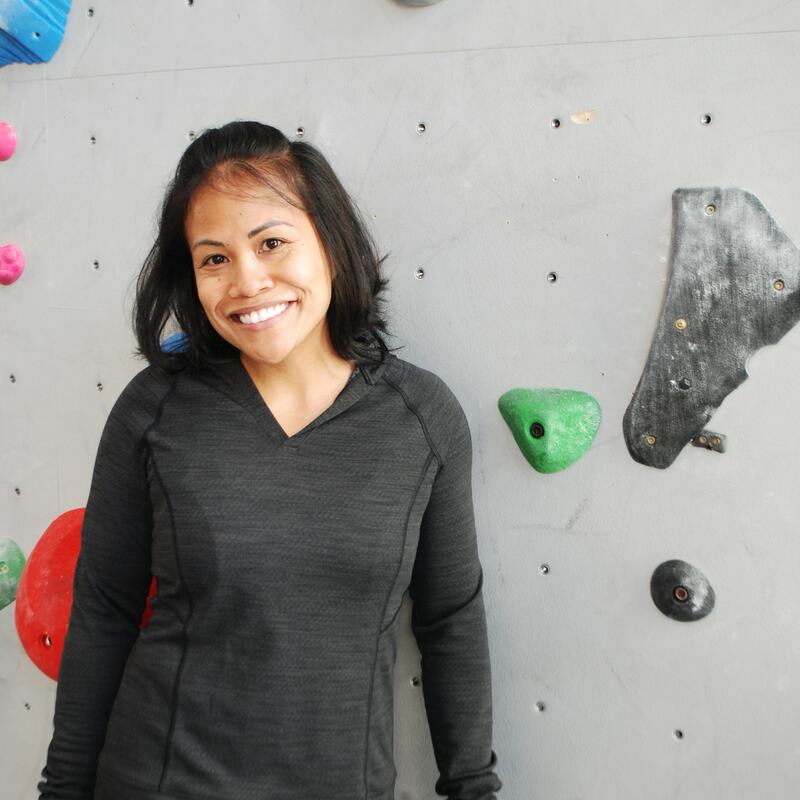 Member Spotlight: Jean Juliano - Salt Pump Climbing Co.
Maine life comes easy to Jean Juliano, even if her current home in Portland is a long way from where she was raised - the island of Kaua'i in Hawaii. "I like living the coastal life like I did growing up on an island, but here I can venture farther and the roads don’t end. Back home, you can only drive in circles or from one end to the other," the thirty-two year old says. Her wanderlust has pushed her to travel and climb far and wide, from the volcanic crags of Hawaii to sandstone of Germany and the Czech Republic. A committed learner and and exuberant presence around Salt Pump, Jean sees a lot of similarities between climbing and her career as an interaction designer. "The different styles of climbing (bouldering, sport, trad, ice) are like different digital spaces/ devices. There's a process that you have to go through in each setting to achieve a certain goal," she says. "There's an experience that happens." Home, where I grew up, is on the island of Kaua’i in Hawaii, but currently living in Portland, ME. 2. What’s the best thing about living in Maine? The best thing about living in Maine is how accessible outdoor climbing is compared to other places I’ve lived. I love that I can do multi-pitch trad just 1.5 hours away in North Conway or drive just a few hours more to reach other classic climbing areas like Acadia and the Gunks in NY. If I want a quick bouldering session outside, I can drive less than half an hour to Cape Elizabeth. 3. What’s the worst thing about living in Maine? The worst thing about living in Maine is that you have to wear a wetsuit to surf and paddle board most of the year. We don’t use it back home in Hawaii. Well, we do, but it’s mainly used for scuba diving. It can get pretty cold here, but the tough winters I experienced while in college in upstate NY prepared me well. I like having four seasons. It gives me something to look forward to. 4. How long have you been climbing for? I have been climbing off and on for over 10 years. The last couple of years after shoulder surgery have been my most consistent seasons. I was introduced to the sport through my college outing club at Syracuse University (SUOC). I remember being afraid of heights and not being very good at it, but found it a lot of fun! After a few trips, I became hooked as I got better at it. We didn’t have a gym in Syracuse back then, so I first learned to climb outside. I started on single-pitch top-rope at Little Falls, then followed friends up multi-pitch in the Adirondacks. Eventually, I learned how to Trad lead in the Gunks. I was fortunate to also climb at various parts of Europe when I studied and lived abroad. I remember visiting my friend, Jitka, and her family in Czech Republic. She took me climbing at a place called Sächsische Schweiz on the border of Germany. We climbed these standing towers where you could only place slings with knots made from rope to protect yourself on lead. You’d have to jam these knots in the cracks for protection. It was an interesting experience. After college, I went back home and moved to the island of O’ahu for a couple of years where I started leading sport at a crag on the north shore called Mokule’ia. 5) What makes climbing unique? What makes climbing unique to me is that it’s one of the few activities that clears my mind. It requires so much concentration and focus, especially when on lead, that you really can’t think of anything else. It pulls me to the present moment, without much effort, allowing me to focus on my breath and subtle movements as I navigate my way to the top of a cliff. I also love the different spaces it offers depending on the level of interaction you are looking for. I can boulder solo if I want to be alone and have a quiet space in my head. If I want to bond, catch up with, or get to know someone more, a multi-pitch Trad route offers me that space. Or, if I want to have a social afternoon with a group of my friends, we can set up top ropes or work on several sport routes next to each other. 6. What is your biggest climbing goal for the next year? My biggest climbing goal next year is to lead a multi-pitch 5.10 Trad Route. I haven’t pinpointed a specific climb yet. I met my goal of leading a multi-pitch 5.9 Trad Route this year, called Recompense, and sent all pitches. I led a bunch of other 5.9s on my list this season as well so I think I’m ready for 5.10. I’m so grateful for my friends and coaches who kept the stoke high with me all year long to help me reach my goal. 7. What is your biggest non-climbing goal for the next year? My biggest non-climbing goal this next year is to take both my parents on an international trip for their birthdays. I’ve already booked tickets to take my mom on a trip in January but haven’t quite figured out where I’ll be taking my dad yet. It’s my way of saying thank you to them for their efforts in raising me. I just want to give them a travel experience they’ve never had. My parents were always working multiple jobs when I was younger so they could provide for my siblings and I, so leisurely activities and hobbies weren’t an option for them. Now that I am stable with my career, I want to take them somewhere they want to go that they’ve never been to. 8. If you were completely immobilized in a hospital bed for a year, what hobby would you do? This makes me think back to when I had shoulder surgery a few years ago and couldn’t climb for a year. My fiancé, Geoff, inspired me to sign up for the AR50 ultramarathon to train for in California. This kept me occupied physically so I wouldn’t get depressed from not being able to climb. But if I was completely immobile for a year, I’d pick up several hobbies and interests that I’ve put on the side before climbing became my primary focus outside of work. I can’t pick just one. To maintain connection with people in the community, I’d volunteer remotely as a life/career coach with the help of technology. I was a college career advisor for a few years and loved coaching students on how to find and interview for jobs. I also enjoyed advising them through life challenges. With a laptop and Siri to take voice commands on my phone, I can make an impact one person at a time. I still stay in touch with some of my students from California and it’s nice to see them advance in their careers. I’d also do more singing and poetry. I’d get into Spoken Word or have Siri record my poems. Lastly, if they allow me to wheel in on a hospital bed, I’d participate in another startUp weekend event for fun and pitch a bunch of ideas that come out of my head. If one of my ideas get voted in, I’d like to see how far I can take a project by delegating a team to move it forward since I’d be immobile. 9. What’s the hardest you’ve tried recently? the runout getting to the first placement at the bottom of the crack. I thought it was safer to keep traversing left on the ledge to get on the 5.10d because it looked better protected. To some people, that may not have made any sense, but it did to me at the time, and safety was my priority. It was my first 5.10 attempt on lead, and it was a 5.10d! I had to aid through the crux. It was hard! I made the mistake of filling up all the crucial finger holds on the crack with gear, so I struggled up it. It was hot in the middle of summer and so I had a hard time trusting my feet on the slab to commit to the last few moves on the crux. I tried, and my friend Ben helped me through it. It’s on my list to tackle again next season, but with more finesse. Outside of climbing, learning to play Meghan Trainor and Sara Barreilles songs on guitar and piano have been a challenge. I haven’t been as consistent playing music like I have been with climbing, so I’m glad for the change in weather so I can shift my focus. Coordinating your fingers with notes, chords, the rhythm, and singing is pretty difficult. 10. What’s the hardest you’ve laughed recently? One day Geoff came home and said “Jeanie, look, I’m going to give you some fish kisses.” I was thinking he was referring to Hershey chocolate kisses shaped like fish, or maybe goldfish crackers shaped like kisses, but instead he made the fish face, stared at me, closed his eyes, and gave me like 10 fish kisses in a row. It was pretty hilarious! And cute. You should try it with your partner. It will bring a good laugh. I remember I couldn’t stop laughing and giggling after that happened. 11. Who inspires you to try hard? My younger siblings. They are much younger than I am and in watching them grow and evolve into their own identities, I have noticed how they’ve incorporated some of my ways of living and avoided making the same mistakes I’ve made. I know they look to me for guidance as they’ve watched me go through life as their big sister. They’ve seen me pack my bags to experience a different world from what I grew up in, and it’s nice to see them pack their own bags. Knowing they look up to me inspires me to try hard in everything I do, and have fun while doing it. I want them to know that a balance in career, passions, and relationships are something they can have no matter how hard it may feel navigating through the different stages they are at in life right now. I want them to experience that success isn’t measured by the job you have or how much money you make, but the joy, fulfillment, and impact you can have in life with the people and things around you. Its what you make with the hand you are dealt. 12. What’s your greatest strength? My persistence. I’ll stick with a long problem until I figure out all the moves. I like seeing my progress. It’s synonymous to how I approach life. Life throws so many curveballs at you, and you just have to work your way through it. Falling is not a failure if you tie back in and try again. Some days just aren’t your day, so you take a rest. Sometimes it’s just doing a different move. 13. What’s your biggest weakness? Keeping still. I have a lot of hobbies and interests, so I’m always doing something when I’m not asleep. I’m pretty lucky to have Geoff in my life who is supportive and understanding of my passions and goals as he also pursues several of his own. But I’ve been trying to stay home more, especially now that the weather is changing. 14. Why do you climb? I feel it’s a healthy form of exercise that gets me to enjoy the outdoors and challenge myself both mentally and physically. It allows me to meet new people, bond with friends, create trust with others, and build a community. It helps me to feel balanced with other challenges I face at work and in my personal life. It provides me a way to earn and appreciate the view of beautiful landscapes I visit that I wouldn’t look at the same if I drove up to the top. It helps me appreciate life and the nature around me. I also love gear and learning how to use it. A lot of gear is required in climbing.